London-based, Brazilian-born, American-schooled former criminal psychological researcher and glam rock guitarist Chris Carter opens his crime writing account with a twisted serial killer tale set in Los Angeles. 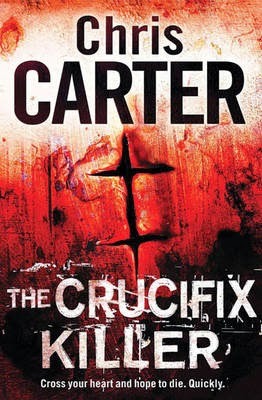 In Carter's debut, THE CRUCIFIX KILLER, an isolated and grisly crime scene gets a whole lot worse for LAPD Homicide Detective Robert Hunter when a strange double-cross is found on the body of a sadistically tortured murder victim. The same cross that was the signature of the infamous, and executed, 'Crucifix Killer'; a signature that had never been publicly revealed. Carter creates Hunter as a former wunderkind 'profiler' whose PhD thesis apparently became a training manual for the FBI. After some past mistakes, including helping convict an innocent man for killing his wife (only to discover after the convict's suicide that another man was responsible), Hunter has lost his early-career lustre: he likes whisky, sleeping around and is plagued by insomnia. In THE CRUCIFIX KILLER Hunter and his rookie partner Carlos Garcia are charged with tracking down a vicious killer whose actions bring the past brutally crashing into the present, and raise disturbing questions about the original investigation, arrest, and execution. Are they now facing a copycat with intimate knowledge of the earlier killings, or did the police, including Hunter himself, perhaps make another massive mistake, and the real killer is still out there? While an innocent man was executed? Overall, THE CRUCIFIX KILLER is a mixed bag. Unfortunately some of Carter's storytelling skills don't yet match his storylines. He has a reasonable sense for pace, builds tension nicely, creates some engrossing set-pieces and nice imagery, and does a good job with hooks, set-ups and later reveals, but falls short elsewhere. Disturbingly regular outbreaks of clanging dialogue, a lack of subtext, extremely cliched or bland description, and annoyingly redundant adverbs and attributions, often pulled me out of an otherwise exciting story – and spoiled what could have been a very good read. As I read, I found myself groaning and rolling my eyes all too regularly. But to be fair, I also found myself continuing to turn the pages - in spite of the dialogue and description. THE CRUCIFIX KILLER does hook you very well at the beginning, and despite the flaws in the storytelling, the story itself is one you want to follow right to the end. Carter does a good job at making you 'want to know'. Carter also does a reasonable job showing the effects of a tough investigation on those involved, beyond the professional sphere - the new case (revival of an old case?) puts extra pressure on Hunter, who already has one dead partner and fears that his new girlfriend Isabella could also become a target. Young Garcia struggles to keep the required balance between his demanding new job and his relationship with his wife. Overall, the flaws create a 'lightness' and lack of authenticity or depth that diminishes what could have been a great crime novel. Instead this debut is a solid, not spectacular, start. As a storyteller, Carter shows promise, needs improvement.